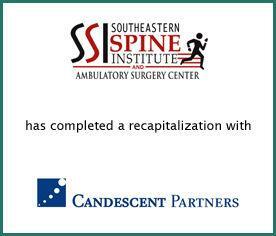 Southeastern Spine Institute, LLC (SSI) has completed a recapitalization with Candescent Partners, LLC (Candescent). SSI is the largest medical practice in South Carolina exclusively specializing in spine care. Provident Healthcare Partners served as exclusive financial advisor to SSI. The terms of the transaction were not disclosed. “Candescent has a strong track record of being a first mover in leading consolidation efforts in sub-specialties within physician services. With the leadership at SSI, we expect this partnership to experience tremendous growth in the orthopedic and spine market within South Carolina and beyond,” noted Robert Aprill, Analyst at Provident Healthcare Partners. “Southeastern Spine Institute is a true market leader within the spinal care industry, evidenced by the vast geography their patient population covers, and stands as a true center for excellence. We believe partnering that reputation with a proven developer of specialty healthcare practices in Candescent, will lead to tremendous growth and the development of a leading regional platform,” stated Scott Davis, Senior Associate at Provident Healthcare Partners. SSI’s medical campus occupies over 41,000 square feet on three acres of land in Mount Pleasant, South Carolina. The Company has state-of-the-art spine MRIs, digital X-ray and most forms of diagnostic equipment. The medical facility has multiple non-surgical treatment rooms and block suites, as well as an in-house pharmacy and physical therapy center dedicated exclusively to treat spinal related problems. For more information, visit www.southeasternspine.com. Candescent is a Boston-based private equity firm that invests in the acquisition, growth, and recapitalization of lower middle market companies in healthcare services, business services, software and consumer products and services. Steve Jenks and Sandy McGrath founded Candescent in 2008. Steve Sahlman joined the partnership in 2009. Candescent invests in businesses with annual EBITDA between $2 and $8 million and enterprise values between $10 and $75 million. For more information, visit www.candescentpartners.com.